As of Saturday, May 31st customers flying on domestic flights will incur an increased rider fee of 120%. The original $5 rider’s fee was implement in 2011, but in early 2015, the Department of Civil Aviation Authority announced the increase of the fee to $6. The fee will be charged to all tickets issued from all domestic flight agents (Tropic Air and Maya Island Air). According to Minister of Tourism, Culture and Civil Aviation, Honorable Manuel Heredia Jr., the increase in fees is to continue improvement efforts on local runway strips to better accommodate the increase in air traffic. Originally, the rider’s fee was imposed on commuters to cover the construction costs of the Belize City Municipal Airstrip. With construction of the Municipal Airstrip now into its third year, Heredia explained that revenue collected from the rider’s fee will go towards ensuring that all airstrips are in superb standards. “When the municipal airstrip is complete, it will be equipped with everything necessary to provide the best service. It will have runway lights which will benefit emergency night flight. With the municipal airstrip complete there will no longer be the need to open the Philip Goldson International Airport at night so that emergency flights can land, which takes more than an hour to do so. With this they will be able to go directly to Belize City. The airstrip will also have backup generators so that even in power outages it will work perfectly,” said Heredia. President of Tropic Air, also agrees with the use of the funds to upgrade the Municipal Airstrip. “The long term impact is good because the facility will have a long, wide, lit runway that is capable of handling aircrafts that come in and out of it with plenty of safety margin. I think the renovation will improve safety for our domestic passengers. I see this fee as a positive because our runways will receive much needed attention. The way the Municipal Airstrip was initially designed, it was not conducive to safety. It had a short runway and was not properly directional. With these improvements, we will be able to more confidently assure our passengers’ safety,” said Grief. Heredia explained the new method being applied when charging. “At first it was going to be by ‘stop’, but we saw that the charge for that would have been too high. So we changed it to ‘per-leg’ of your travel. 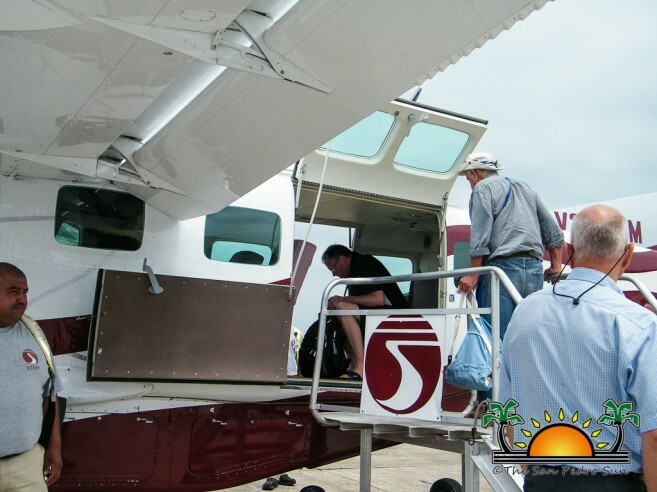 What we are trying to convey is that if you want to go from San Pedro to Placencia and there is no direct flight, so instead you go to Belize City first and then to Placencia. You will have to pay the rider’s fee twice: from San Pedro to Belize City and from Belize City to Placencia. But let’s say you buy a ticket from San Pedro to Belize City and the plane stops in Caye Caulker, you only pay the rider’s fee once because your ticket was direct to Belize City. You are not going to be charged for every single stop the plane makes. You will only be charged for the leg of your destination,” explained Heredia. The rider’s fee will be charged automatically at the time of ticket purchase. For further clarification you can contact Sarah Dalsin at Tropic Air at 226-2380 or the Belize Airport Authority at 223-3784. Going from $5 to $6 is a 20% increase not a 120% increase. Going up $6 to $11 would be 120%. So which is it?